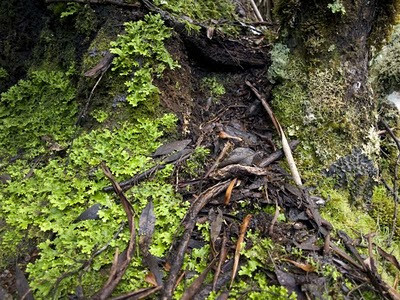 One winter, nearly 31 years ago, something very unusual happened in Mt Field National Park in southern Tasmania. The night of Friday August 10th 1979 saw more than a metre of snow fall on its mountains. Driven by a freezing south-westerly wind, the snow smothered the park from low levels to the heights of Mt Mawson, changing the shape, sound and look of the mountains entirely. Skiers keen to spend their Saturday taking advantage of this amazing snow cover – one John Davis among them – must have rubbed their mittens in anticipation. With the whole area skiable, many skiers were ascending and descending the slopes when, without warning, a snow cornice above the Golden Stairs collapsed. John Davis and some other skiers were trapped beneath. While the others were rescued, John remained buried in the snow and died. His was the first death by avalanche recorded in Tasmania: a grisly and unwanted statistic that is unlikely to be added to, given climate change and the kinds of snow seasons Tasmania has experienced this century. My first year in Tasmania was the year after this tragic death. Every visitor to the ski-field was told the story, and most had a grim desire to see the site. I was among those who gingerly climbed the Golden Stairs in snow, subsequently skiing cross-country towards Mt Field West. But from the mid 1980s onwards, skiing at Mt Mawson was starting to become a hit-and-miss affair. And this century not many winters have seen a good ski season. I returned to the area earlier this July, enjoying an icy excursion into the highlands, ‘though not via the Golden Stairs. Like the gaping jaws of Sydney’s Luna Park after the ghost train tragedy, the “stairs” have a sad taint. The route is now closed. While it was cold wandering over to Tarn Shelf – this was July after all – there was barely enough snow for a miniature snowman. The visit confirmed that I’d never invest in ski gear for use in Tasmania. It also had me reflecting afresh on John Davis’ dreadful luck. New Zealand is another matter altogether. While their glaciers are shrinking, skiing is alive and well. And avalanches still manage to claim many lives every year. Even in late spring, trampers on many of Aotearoa’s mountainous tracks are advised to check avalanche forecasts. In some places bridges and other infrastructure are removed over winter to prevent them being swept away by avalanche. It is sobering to walk through an avalanche zone, especially when Kiwis tell you with a smile that a football sized snow-ball at terminal velocity will take your head off. “But the good thing is, you won’t hear it coming” one added, with typically dry gallows humour. I’ve always been attracted to green: to well-watered landscapes, forests, mountains and fertile fields. In short to Tasmania. But despite this bias, I have spent time in Australia’s more arid areas, and have come to appreciate the subtle charms of the drier life. While Bendigo is scarcely arid, it’s certainly drier and flatter than home. And during the droughts that have ravaged central Victoria over the last decade it has seemed desert-like at times. Exotic gardens and trees have died; lawns have turned to dust-bowls and water has become as precious as the gold on which the area was built. That decade has coincided with regular visits to family living here. 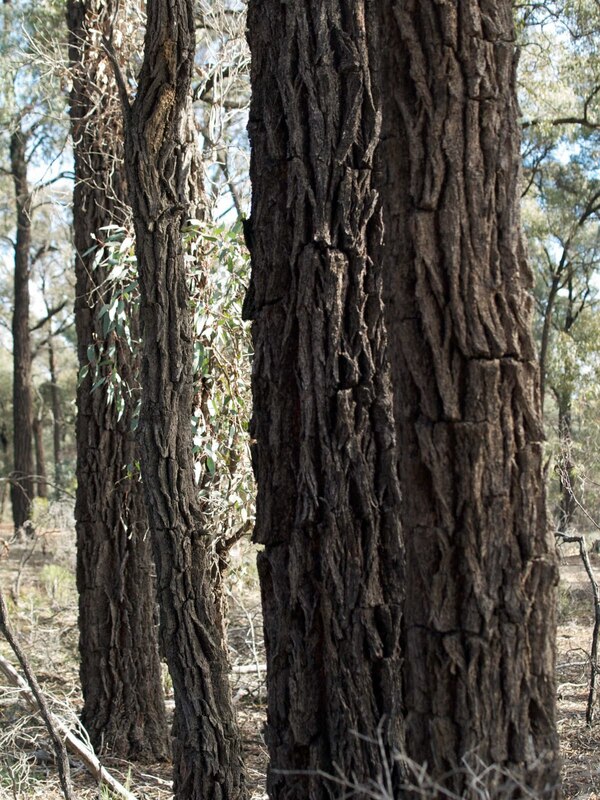 In that time I’ve grown to intensely appreciate the region’s ironbark forests. 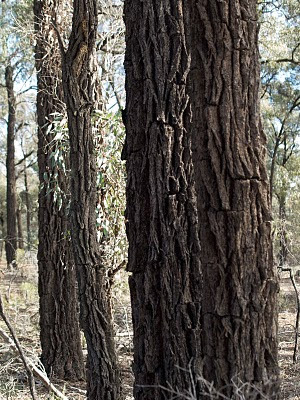 These brilliantly drought-adapted gum trees (Eucalyptus tricarpa) are characterised by dark and deeply furrowed trunks. Their rusty, teak-tough exterior is matched by their timber. On one visit, we happen across an old eucalypt cutter’s cottage in the Whipstick State Park, just west of Bendigo. As we stop to photograph the tumble-down cottage, the owner of the newer farmhouse behind whistles us over, thinking we’re heritage professionals. He tells us a bit about the cottage, and some of the timber-cutting history of the area. He’s surprised to learn we’re looking for somewhere to walk. “Oh there’s not much here” is his region-deprecating summary. We drive off and find some nearby forest to investigate. We spend the next two hours walking just a few hundred metres and exploring the farmer’s “not much” in great detail. We’re totally enthralled by how the bush has responded to recent winter rains; by the amazing variety of its life-forms; by the subtle variations in plant species over just a small area. We laugh at a fungus that imitates animal poo; marvel at an ants’ nest that chimneys above a flood-prone hollow; are charmed by the tinkling calls of unseen birds; can’t resist photographing a fallen ragged blossom; play detective with animal tracks in the mud. 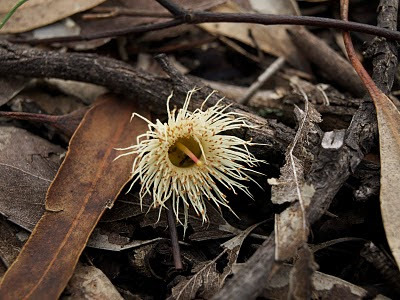 We realise we’re the odd ones out, wandering on tracks made only by roos, lying in the dirt to shoot close-ups of wildflowers or ants or short-lived grasses. We know that by everyday standards these activities seem at best eccentric, at worst rather mad. 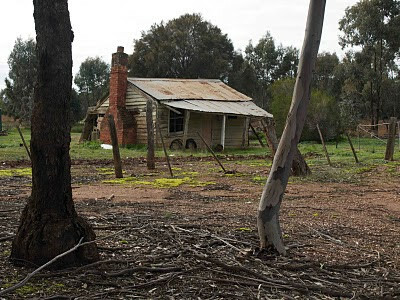 But we can’t help feeling sad that most Aussies don’t know about or appreciate these sorts of environments; that for most of us there really is not much here in this wide brown land. If you think I’m exaggerating, read some popular travelogues of Australia – say Bill Bryson’s Down Under – and count how many times you read phrases like “vast emptiness” or “mile after mile of nothing”. Alternatively, if you’d rather find out for yourself, get a bird book, a local plant guide, a pair of binoculars and a camera, and walk out into some Australian bush. If you take your time, ask yourself a few questions, and watch patiently, you might be pleasantly surprised to find what’s really out there. My senior high biology teacher, Mr Harnack, was fond of asking questions. Nothing unusual about that, I suppose, except that it was always the same question. And he would ask it every single lesson: What is life? 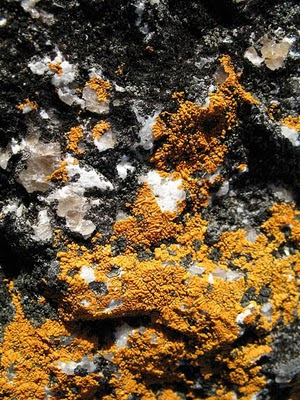 Spending time among lichens in recent days brought Mr Harnack’s question to mind. It’s not that I doubt lichens are a lifeform. They are actually one of the more complex and interesting forms of life on earth: a symbiosis between two other living forms, algae and fungi. Because the algal part of the partnership processes light via photosynthesis, lichens have some plant-like characteristics. However unlike plants, if they experience extended periods of heat, drought or cold, they can go into a suspended state – known as cryptobiosis – until conditions improve. They may appear dead, hanging as crisp and lifeless as dead leaves, when they are actually full of life. Hence my asking the Harnack question. Cryptobiosis enables them to grow in locations impossible for most plants, including bare rock, sterile soil or sand, and human-made structures like walls, roofs and tomb-stones. And they can grow on other plants, even in the darkest depths of a rainforest. That’s where I most recently encountered them, luscious and luminescent on the trunks of rainforest trees. But I’ve also seen the more demure forms that blotch granite boulders or daub dark dolerite. And the Harnack question comes to mind wherever I observe this intimacy between lichen and its substrate. The growth habits of lichen seem to blur the distinction between the living and the dead. Where, for instance, does the rock or dead bark end and the lichen begin? Does the fungal part of the organism reach deep into the rock as fungi will in soil. And can the substrate really be excluded from the symbiosis if the lichen “protects” the rock or bark? I observed its role in bridging the living and the dead when visiting some Alaskan glaciers a few years ago. There lichen plays the part of John the Baptist, preparing the way for the lifeforms that will come after it. As glaciers retreat – and they have long been seen to do so in Alaska – bare rock sees the light of day for the first time in millennia. Lichen colonises the fresh faces, slowly doing its rock-breaking, soil-producing work. 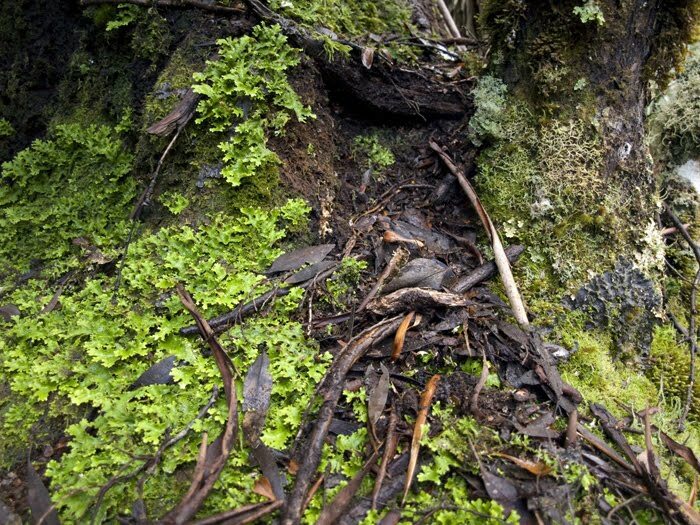 The soil then enables other pioneering species, plants like willow, fireweed and alder, to gain a foothold. In Alaska it takes 70 to 80 years from glacial retreat to full-blown coniferous forest. That’s a startlingly short time in earth history, and a testament to the influence of the easily overlooked wonder that is lichen. What a vantage point we have, caught as we are between earth and sky! You might technically call our dwelling place superficial, but taking into account the vastness of the universe, it is an extraordinarily uncommon superficiality. There are some trees near home that highlight for me this amazing event horizon; this junction of heaven and earth. 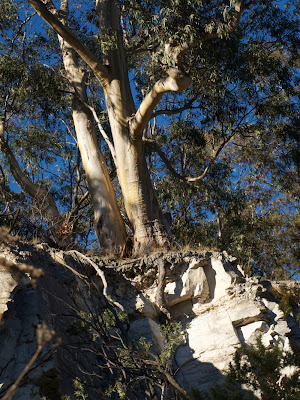 Both are humble trees, silver peppermints (Eucalyptus tenuiramis). One stands atop an old quarry in Strickland Avenue. Perilously close to the edge, the twin-trunked tree clasps the crag with crooked hands like Tennyson’s eagle moreso than a tree. 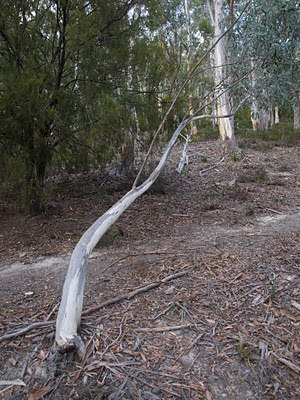 Often eucalypts have shallow roots, and certainly lack the tap roots that we associate with many plants. Rather they splay out strong, sometimes buttressed roots that give them a good toe-hold against storms. This particular peppermint stands on mudstone with a very shallow soil overlay. Both rock and regolith are poor sources of nutrient, and highly prone to drying out. So the tree has grown used to the botanical equivalent of thin gruel. And yet it has done far more than eke out an existence. It has a handsome golden-flecked double bole, each trunk creased and rumpled, stretching and tapering with a slow and crooked patience towards the sky. Its irregular branches, some clean and straight, others arthritic and contorted, seem all well-covered with narrow grey-green leaves. Here and there past difficulties have produced failed branches, some hollowed out to owl’s-nest perfection; others still pointing in mute accusation at an unblinking sky. The tenacity of tenuiramis is illustrated elsewhere in our local woodland, a place much put upon by fire, feet and mountain bikes. This tenuiramis seems just a sapling in terms of height, although a hard life may have stunted it. It faces up the slope, almost recumbent, as though it's about to succumb to fatal wounds. Yet on closer inspection I can’t help smiling as I see a nyad extracting her feet from a hole, or a dryad frozen in the act of escaping. No, this tree too is thriving, with a good covering of leaves, and a fair chance of weathering the prevailing nor-westers for decades to come. I find G.K. Chesterton’s fanciful description of a tree very apt here. It is when we consider it as a prodigious wave of the living soil sprawling up to the skies for no reason in particular that we take off our hats. Tenacious tenuiramis, I dips me lid to you!